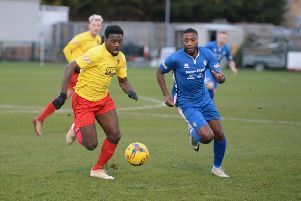 Barton Rovers finally recorded their first home win in the league this season after a fine performance saw Marlow put to the sword on Saturday. Going into the game, the hosts had drawn four and lost 11 of their 15 encounters at Sharpenhoe Road this term, but that was all about to change. Rovers might have taken the lead after just five minutes as Dan Jarvis blasted over when he should have at least worked visiting keeper Simon Grant. Lincoln saw an effort fly just wide, as did Ben Sawyer, but Marlow striker Lee Barney should have opened the scoring, wasting two changes in quick succession. Marlow paid dearly for these two misses when captain and man of the match Drew Phillips sent Robbie Parsons away to open the scoring just after the half hour. Bovers were playing some excellent football, with Ronayne Marsh-Brown and Jarvis prominent, as Sawyer’s lob saw Grant scramble back to save, with home keeper Matt Finlay denying Barney on the stroke of half time. Playing down the slope for the second period, Rovers took the game to their opponents and were well on top when Parsons was felled in the box seven minutes in. Phillips despatched the penalty, while just moments later, he found Sawyer in acres of space inside the Marlow area to make it 3-0. This weekend, Rovers head to local rivals Bedford Town.